Though Samuel Vargas and Jussi Koivula will square off in the main event on November 11, the undercard at the Brampton Powerade Centre that night will feature headline-caliber talent. Flanking the Vargas-Koivula WBA-NABA title fight will be a stacked undercard featuring a pair of emerging Lee Baxter Promotions contenders from abroad. In the co-feature, super featherweight Alex Dilmaghani battles Finland’s Tuomo Eronen. Dilmaghani is fresh off an emphatic victory over Ulises Perez on July 21 in the headline role of a LBP event at the Danforth Music Hall in downtown Toronto. The UK-based sharpshooter displayed improved power and aggressiveness in walking down and stopping the battle-tested Mexican in six rounds. Dilmaghani has honed his craft all over the world, once fighting under the tutelage of Hall of Famer Nacho Beristain at the Romanza Gym in Mexico City, the same venue that has produced legends such as Ricardo “Finito” Lopez and Juan Manuel Marquez. At one point, he was also guided by former world champion Ricky Hatton, before making his professional home in Canada. One of Baxter’s newest signees, Stanyslav Skorokhod will fight at the Powrade Centre for the first time as well, as he takes on Fernando Silva in eight round super welterweight action. Skorokhod made his Canadian debut on July 21, smashing veteran Nestor Garcia in just three rounds. Skorokhod (15-1, 12 KOs) was a competitor in ESPN’s prestigious Boxcino tournament, and had a lengthy and storied amateur career in his homeland, fighting in the same amateur system that has produced Vasyl Lomachenko and Oleksandr Usyk. “We’re seen what the top Ukrainian amateurs have been able to do in a short period of time as professionals, and I think Stanyslav is capable of that. With a couple more victories, he can be right in the world title picture.” said Baxter. The undercard will also feature a bevy of Canadian talent, such as super bantamweight prospect Marc Pagcaliwangan, light heavyweight Nick Fantauzzi, welterweight Deepak Tanwar, “Brazilian Bomber” Mayron Vieira Zeferino and women’s star Shelly Barnett. 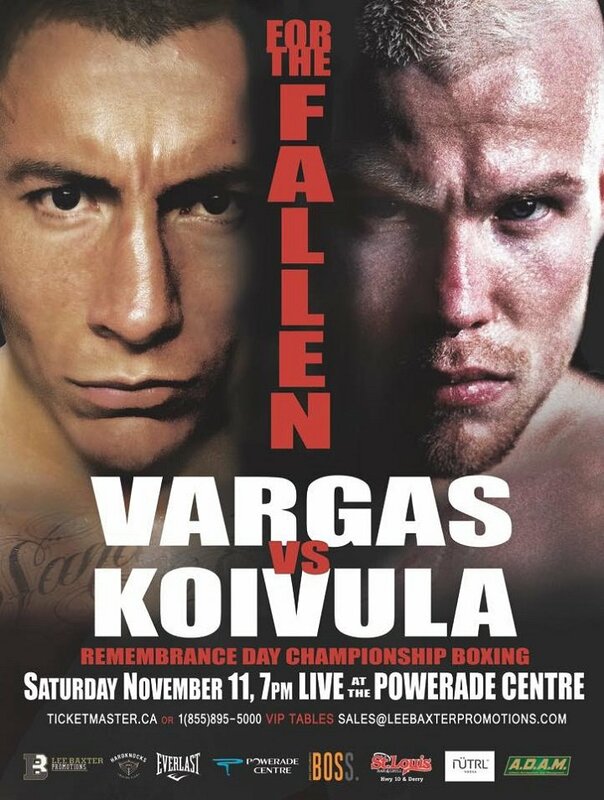 Samuel Vargas and Jussi Koivula will battle for the WBA-NABA welterweight title as they headline “For The Fallen,” a Remembrance Day championship boxing event at the Powerade Centre in Brampton, ON, presented by Lee Baxter Promotions. Vargas (28-3-1, 14 knockouts) is coming off the biggest victory of his career, a thrilling unanimous decision over three-time world title challenger Ali Funeka in August. The WBA-NABA champion displayed a blend of nuanced boxing skill, and raw aggression that’s made him so popular in the Canadian boxing community. After coming up short against the best welterweights in the world, Errol Spence and Danny Garcia, Vargas has shown that he’s continued to improve as a fighter and is ready for another shot. Standing in his way is one of Europe’s top welterweights, Jussi Koivula. The Finnish star has challenged for both the European and European Union titles in the past, but a bout with Vargas undoubtedly presents the biggest opportunity of his career. Koivula (23-4-1, 9 KOs) was introduced to the Toronto audience during TIFF, when a critically acclaimed documentary film about his life “Daddy Loves You,” aired during the festival. Prior to his successes in boxing, Koivula dealt with plenty of tragedy—losing both of his parents, and four members of his family in total to alcohol or drug abuse. Like so many before him, Koivula has found refuge in the sport of boxing. “Jussi’s story is incredible, and on top of that, he presents a very real challenge for Sam. Both of these guys have overcome tremendous obstacles both in their careers and in life, and a win for either man would be absolutely huge,” said Baxter.